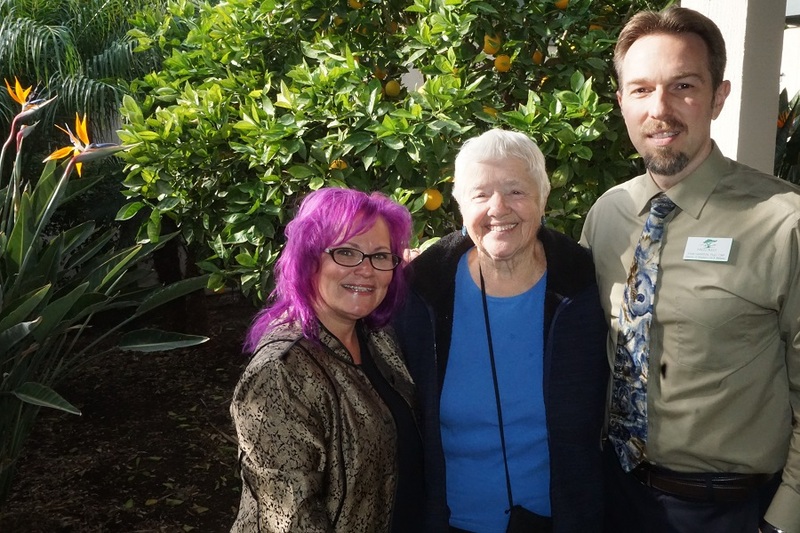 From left, Dr. Kelly Niles-Yokum, Dr. Peggy Redman and Dr. Ryan Harrison enjoy the sunshine of their observations. LA VERNE, California, January 17, 2018 — Have caregivers responsible for communicating with people who have dementia, which includes Alzheimer’s Disease, been carrying on the wrong conversations? If any center is qualified to answer, let alone address, that question, it’s Hillcrest, which as one of the nation’s leading continuing care retirement communities, offers residents not only independent, assisted, and skilled nursing options, but also memory care. Although dementia is an irreversible brain disorder, caregivers at Hillcrest, working with gerontology (study of aging) students from the University of La Verne in a program called Dementia Connections, believe that by changing the conversation around dementia, they can not only slow progression of the disease but enrich the lives of those dealing with declining memory and cognitive function. Often obstructing that conversation is the heavy fear and stigma attached to dementia. “No one ever talks about it,” said Dr. Kelly Niles-Yokum, chair of ULV’s gerontology department. So unlike the treatment of other serious killers like heart disease and diabetes, the looming issue of dementia is more often greeted with an uneasy levity or frivolity. That attitude spills over into the care and treatment of older Americans, or, should we say, lack of treatment. Often treated like social pariahs, dementia sufferers become disconnected to their social sphere, resulting in even greater loneliness and isolation. “It’s a trajectory that can lead to premature death,” Dr. Yokum said. To begin changing that trajectory, Dr. Yokum offers her students, who often mirror society’s fear and stereotypes of older people, a “Perspectives on Gerontology” class. Before being accepted into the class, she interviews them. “But that’s a form of compassionate ageism,” Dr. Yokum said. In other words, her students’ hearts come from a good place; they’re just not directed at addressing the real problem. They haven’t been truly educated yet on helping older Americans age with dignity and respect. That education begins in earnest, when Dr. Yokum pairs her gerontology students with Hillcrest’s memory care residents at Southwoods Lodge. Every resident at the Hillcrest facility has been diagnosed with a dementia disorder. “In the beginning, the students are terrified,” Dr. Yokum said. The terror — and awkward silence — melts away as students get to know the residents as human beings with full narratives and rich histories rather than adults reverting to infancy. In effect, the Lodge has become both a teaching and learning lab, where small breakthroughs and inroads on how to advance care for those living with dementia occur on an almost daily basis. Hillcrest has long been out front in treating residents holistically, venturing far beyond the normal care continuum of feeding, bathing and providing medications for residents — and Dementia Connections will only enhance that momentum. As a program, it will further build on the human element that has always been at the core of Hillcrest’s mission. Instead of being so task-driven, always trying to do things to and for residents, students in Dementia Connections will learn to simply be there for them — in the here and now. New interactions between students and residents will also involve more direct talk and less distraction, especially when things start going sideways. “Distraction (‘Oh, look at that flower, isn’t it pretty?’), is not really helping a person living with dementia,” said Ryan Harrison, Director of Resident Life and Wellness at Hillcrest. To refocus care on the patient, both Dr. Harrison and Dr. Yokum are showing students how to literally change their conversations with residents by practicing validation therapy. “‘Validation’ says that instead of redirecting and distracting (‘Oh, don’t be sad, it’s a beautiful day, let’s go outside’), and telling those gentle white lies, meet those people right where they are,” Dr. Harrison said. “If they are very sad, go into that sadness with them, if they’re angry, mirror their expression. What happens is you’re building a connection of trust, at that moment. That person is no longer alone and they know it. Emotions change and the relationship deepens. Dr. Peggy Redman, whose husband Ray is a resident at Southwoods, is an advocate of Hillcrest’s approach. Facing the disease head on, the same way one might tackle heart disease, asthma or diabetes, has helped keep things real and in the moment for Dr. Redman. Recently, she was asked to address a men’s group about how she was coping. There might not be a cure for Alzheimer’s on the horizon, “but you can help people be productive for longer,” Dr. Redman added. Dr. Harrison knows what’s not productive. Some care centers line dementia patients around a table and then give them pool noodles to bat at a balloon. “A lot of people think that’s cute (‘Isn’t that sweet!’), but if that were your mother or father, would you want them around a table swiping at a balloon with their pool noodle for 30 minutes? Is that the way they want to spend their lives? Another innovation at Southwoods has been the window boxes that the students have made out of shoe boxes or cardboard crates. They contain meaningful objects or keepsakes from the residents’ past, often obtained after interviewing family and friends. The boxes provide students with important links and knowledge about the person they’re paired with. Students also learn that nothing works 100 percent of the time. Sometimes, residents prefer be left alone. That said, the same person rejecting the caregiver might embrace that same person five minutes later. From the results and outcomes that have been observed, no one is turning their back on the program. It’s been a win-win-win. For residents, they and their loved ones have seen their self-esteem and self-respect improve. There also have witnessed physical changes in some cases. “I saw one person who I didn’t even know could talk start talking,” Dr. Redman said. After the intervention of their student caregivers, some Southwoods residents have also experienced less late-day confusion or irritability, a condition known as sundowning. For Dr. Yokum’s gerontology students, they have been exposed to a constellation of interactions and behaviors. At times, they have learned to sit in silence with somebody they didn’t know. They have also learned to check their egos and preconceptions at the door and react in what can quickly evolve into “fluid” situations. They have learned to transcribe and journal their observations. “These are transferable skills,” Dr. Yokum said, adding that some of her students may be empowered to take on aging and ageism the way an earlier generation made cancer public enemy No. 1. For Drs. Harrison and Yokum, they see an opportunity and possibly a grant or two down the line to conduct further research and compile a best-practices guide for the care and treatment of dementia. “We’re here to make it better,” Dr. Harrison said. “More livable,” added Dr. Yokum. “You can do it badly or you can do it well, and we want to do it exceptionally well,” Harrison said. And for Dr. Redman’s beloved Ray. “It’s been a marvelous community of people helping him,” she said. fill all your prescription needs. This is uplifting and inspiring. My father has slow-progressing Alzheimer’s but it’s still heart-breaking and is taking quite a toll on my mother as she cares for him. He still plays tennis two or three days a week for a couple hours at a time, but he asks the same questions five minutes later and can’t remember where things are located in the kitchen cupboards, things he used to know. I know too many people who are dealing with dementia, and I’ve learned it may soon outpace heart disease. However, I’ve also learned (and am still learning) there are certain leisure activities we can do to reduce our risks for getting dementia, so I’m on a mission to spread the good news so people can take steps now to keep our brains as healthy as possible. My mother was told to “sing” to avoid getting dementia. I found a link online about studies being done to see how music and singing help Alzheimer’s patients. Then I met a woman in my senior center tap dance class who is involved in singing for memory care. I think this is terrific. She told me about Dr. Ryan Harrison, so I googled him and found this article. This is all fascinating. Wonderful things are happening at Hillcrest and through the University of LaVerne. I’m in a Toastmasters club and wrote a speech about dementia to compete in an upcoming contest for the inspirational speech category. I never thought I’d have anything inspirational to give a speech about, but I’m passionate about getting the word out that there are activities we can do to help reduce our risk of dementia. I’m still learning and want to keep up on the latest studies. Clearly, there is hope for those who already have dementia and hope for those who don’t have it to do our best to reduce our risks for getting it. I’m so glad I found this article. I just have to say, sixty isn’t old. I’m turning 62 in March and am starting a new career, am back to blogging regularly now that my husband’s cancer is in remission, just signed up for tap dancing, and as soon as I get the hang of it, I’ll sign up for ballroom dancing since that seems to be one of the best activities we can do to reduce our risk of getting dementia. Oh, and I plan to learn lots of new songs so I can sing my heart out while I’m dancing my heart out and setting new goals and inspiring others to learn new skills and reach for the stars. It’s all a matter of perspective, isn’t it?